By FFWPU Thailand, Kamol Thananopavarn: Mr. Porapas Rattanachakorn, the leader of Tribal Messiah group worked with many blessed families who determine to bring victory to True Parents through the mission of Tribal Messiah. 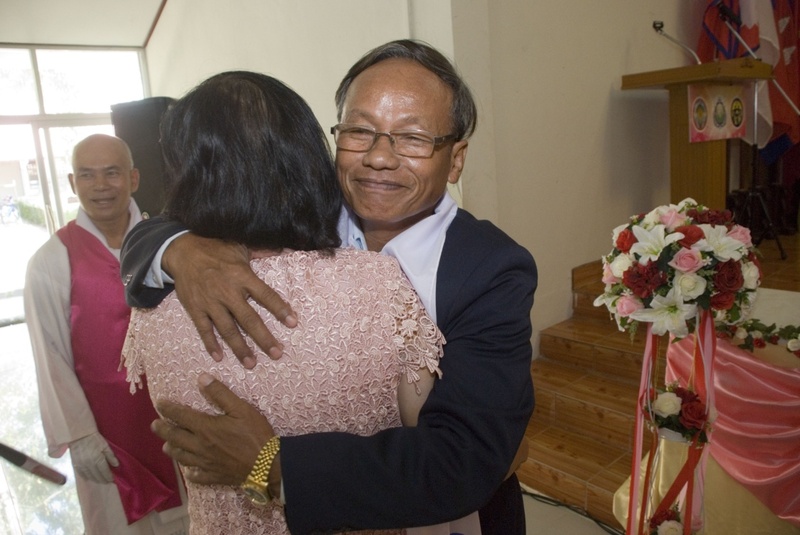 The main hosts of Blessing at Neonkham district are Kittisak Naksaing – Shinobu Yoneda & Mr. Kiattichai Tangmaneesamut – Mrs. Nami Imanishi, both of them are 30,000 couples Thai-Japanese families. On November 21, 2015 the ceremony started by Divine Principle lecture on topic “Family is School of Love and Peace” and Significance of Blessing including explanation of 7 steps to become Ideal Blessed Families which explain about 40 days separation and 3 days ceremony. There were 102 couples attended. The chairman of opening ceremony is Ms. Piyachat Paichon Neonkham District Chief Officer. Mr. Raweetheewat Srisuttisa-ard, President of W-CARP Thailand served as MC. Prof. Kirti Buncheu, VP of UPF Thailand gave welcoming remark. Follow by Holy Wine Ceremony lead by Mrs. Sangkom Netsopa, director of BFD Thailand. Follow by Invocation prayer by Buddhist Monk, Muslim Imam and Christian minister. Rev. Kamol Thananopavarn and Mrs. Huang Shu-Chiung, National Leader of Thailand served as Officiator. The holiest time is the benediction from True Father in Blessing ceremony at Cheongshim Peace World Center on March 2012, then all couples exchange the rings and hug and kiss each other. Then, they receive congratulatory remark by Mrs. Panida Duangjinda, VP of WFWP Thailand. All Blessing participants feel so overwhelmed with deep happiness because they feel their marriages were revived, receiving forgiveness from mistake in the past, the atmosphere of true love and their lineage were cleanse and sanctified. This is the first Blessing held in Chainat province. All community leaders felt so grateful to Mr. Porapas & FFWPU that brought such a great blessing project to small district of Neonkham. They determine to hold blessing again in sub-district level and mobilize all families to participate in the near future.